In my game, Tenshi-Oni (yes a game still in development as of this post ^^;;), I've used the Glyph Designer program to make custom fonts. Anyone familiar with Glyph Designer knows how wonderful of a tool it is to create beautiful bitmap fonts. 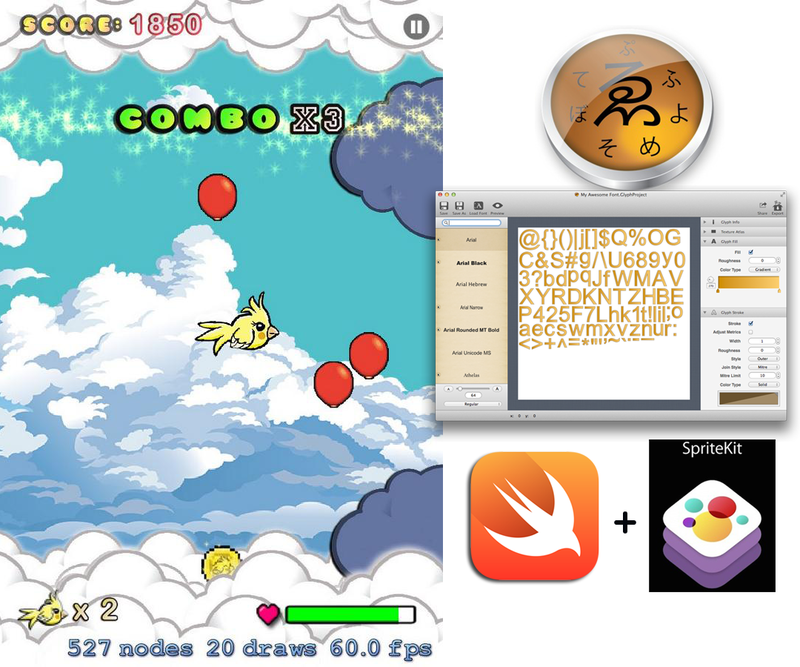 Tenshi-Oni runs in the Cocos2D framework and Glyph Designer works like a charm in it. This also works well in the Sparrow Framework from what I understand. On item 0, create a String matching your font's name and the .otf or .ttf extension ie: "yourfont.ttf"
but... it doesn't quite help with the actual stylizing of that font. For me, and I'd imagine other programmer/designers, I found that SpriteKit doesn't do a great job of customizing a font's look. You can maybe hardcode two fonts on top of eachother to give the effect of a dropshadow or stroke...but it never seems to look right. I feel I'd rather have more control of the font's look and feel than just slapping in a font that I can only change it's color or size. A well stylized font not only catches the player's attention but becomes easier to designer around as you don't have to worry about say.. what background color is behind a "SCORE" text. Always remember this design rule when it comes to text. Using a solid color font might look great on a few different color backgrounds... but what if you create new levels with different color schemes? You'd have to code that font to change color and doing so might change the whole theme you had already established. At least, that's how I feel as a designer in addition to a programmer. Before Swift, Glyph Designer's creators at 71squared already came up with some great helper classes to make up for SpriteKit's inability to use their .fnt methodology. The process for anyone coding in Objective-C was pretty simple.. Build your fonts in Glyph Designer and exporting them as .skf(SpriteKit) and/or .skf(SpriteKit@2x) depending on the resultions you are working with. Note: as of this post, Gylph Designer, does not yet have support for the iPhone 6 Plus's @3x resolution. NSString *path = [[NSBundle mainBundle] pathForResource:@"myFont"
For people coding in Objective-C... great.. it's works fine. But what about doing this in Swift?!? At first, I thought about rewriting the entire SSBitMapFont and SSBitMapFontLabel classes in Swift... but unfortunately you only have access to their interface files (.h files) and not their (.m) implementation files; it's all packed into libSSBitmapFont.a since I'd imagine the implementation code (though probably still obtainable) is proprietary code. As of the date of this posting, 71squared has yet to make these classes in Swift... so, how do you use the code? Simple: Accessing Objecive-C classes via a Bridging Header. In short, a bridging header is a .h interface file that lets you use Objective-C and Swift in the same project. The file is usually named YourProjectName-Bridging-Header.h. Now, you are not out of the woods yet. You still need to create your SSBitmapFont object to then be used by SSBitmapFontLabelNodes. To create the SSBitmapFont object (remember to have your .skf file(s) and texture atlases imported into your project at this point) here's how I do it in PikiPop. First I created a function that returns an SSBitmapFont object. This is the swift version of how 71Squared did it in their demo file. let path = NSBundle.mainBundle().pathForResource(filename, ofType: "skf")! Do note that I made this a class function since I'm using this function during the game's asset loading screen at it's initial dispatch...thus I needed to make this a function of (in this case) my HUD.swift class. I also use global shared variables as storage of this data; this is to only allocate memory once for these font objects instead of calling them over and over again. You don't have to do this but Swift, unlike C/C++/Objective-C easily makes true full copies of objects (not just references) and I don't want to inadvertently cause ARC to do a massive garbage collect nor bog the CPU/Stack by creating another hard copy of something I can just reference to. Also note that as of this post I didn't create the assert warnings well. They seemed to have been firing off no matter if the file URL was right or wrong. I'd advise anyone using this to maybe complete that aspect so to better catch errors than what I did here in commenting them out. Next, create the SSBitmapFont object. Here's how I did it for the "combo_text" font I made... seen in the picture at the top of this post. and there it is. That's the "X3" you see in the photo up top. The "Combo x" uses another font object and so does the "SCORE" text. Also note that the bitmapFontForFile("combo_text") line will use either the .skf file or the .skf@2x file based on which resolution the player is using on their device. So, there's no need to create separate SSBitmapFont objects for each resolution.